I just found this site. I joined a program to make money for $250.00. I joined a guy named Dan Froelke. After I joined I never heard back from him. It really made me upset so I started googling him, I should have done that first but oh well. 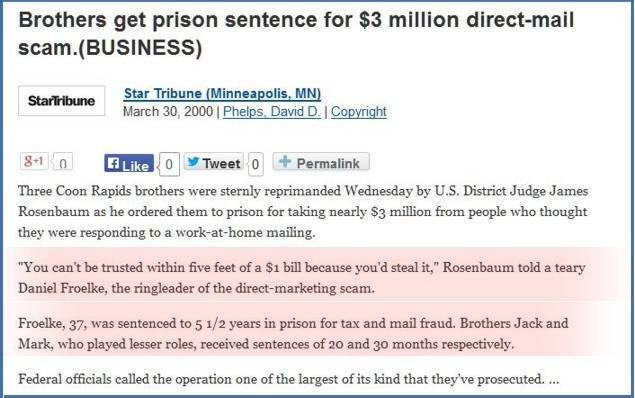 Anyway, I found this Brothers get prison sentence for $3 million direct-mail scam. (BUSINESS) - Star Tribune (Minneapolis, MN) | HighBeam Research and if you look further you can even find his mugshot. Well I put a report on ripoff report. I couldn't believe it! He responded to the report acting like he was me apologizing for making the report! Is this common? You report someone on a site like this and they just come on and pretend to be you apologizing? The more information I look for on him the worse he seems! I know he has to have done this to a lot of others! I joined and paid him $250 and he was just gone! I can't imagine he just picked me to screw over and everyone else he helps. And I know he has sold this to a lot of people because he has the financial pictures showing how much he is making. Well, I wanted to just sound off I guess... When I saw that he went on to ripoff report and pretended to be me... I just couldn't believe it. I posted on that site that since he did that instead of just saying he was sorry and giving me my money back that I was going to tell my story more. So here it is again! Dan Froelke should have just apologized and given me my money back! Unfortunately yes. Maybe not always Daniel Froelke Arrest Details | Stillwater, MN , but many of the people in these threads have been screwing people over for years. Here are a few websites that look to be his. Shall we make a thread about him like we did with Brad? I see he's responsible for 250overandover.com which has been a nuisance for me while researching gifters. shipdit and Shery like this. Shockingly, he's also involved in pizza in a box, or whatever it's called. I've never posted at Ripoff Report before so my post is "under review" or whatever. I propose we all post on there with a link to this site. That would be Rod Stinson's scam, which is a repackaging funnel pulling people into John "Lutarian" Bain's Premier Wealth System pyramid scheme. Please see John's thread for legal details about why that is an illegal scam. Posting a link to the ripoff page. This creature is beyond belief. I've watched it several times and I still can't get over it. What a complete douche!